We’d love your help. Let us know what’s wrong with this preview of We Need to Talk by Celeste Headlee. To ask other readers questions about We Need to Talk, please sign up. Lots of nuggets of wisdom regarding good communication skills, and in particular conversation skills, in this book. After all, "Good conversation doesn't happen naturally, though most of us assume the opposite." (p. 35) Honest and to the point, Headlee's strategies will help you improve your conversation skills, as well as know and understand others better. This book can be summarized in a few short sentences, maybe one for the most part. We need to listen, and actually talk less. This is an important lesson, since we tend to talk and not listen much, and we tend to talk about ourselves. As recited in the book: Sociologist Charles Derber describes this tendency to insert oneself into a conversation as “conversational narcissism.” It’s the desire to take over a conversation, to do most of the talking, and to turn the focus of the exchange to yoursel This book can be summarized in a few short sentences, maybe one for the most part. We need to listen, and actually talk less. This is an important lesson, since we tend to talk and not listen much, and we tend to talk about ourselves. As recited in the book: Sociologist Charles Derber describes this tendency to insert oneself into a conversation as “conversational narcissism.” It’s the desire to take over a conversation, to do most of the talking, and to turn the focus of the exchange to yourself. It is often subtle and unconscious. But it's quite amusing, that in a book that talks about "conversational narcissism" the author writes 90% of the book about... themselves. "I" is mentioned there about 70 million times, and what the author said, thought, heard or bought in a store. Like many of us in conversations, I wasn't super happy or interested in that. * After that meeting, I started to take notice of how often I repeated negative feedback. I did it a lot, and it was affecting staff morale. The thing is, it would have never occurred to me that repetition alone could be heard as criticism had this producer not spoken up. * But more important, the truth is that most of the time we aren’t really listening at all. I was at the grocery store recently and told the cashier, “My reusable bags are buried in my cart. Give me a minute to get them out.” She looked directly at me and said, “Okay, sure. I hear you,” while she was bagging my groceries in plastic bags. I had to repeat myself twice more before she really heard me. * I had relegated the melodies to the background of my mind, not even paying close attention on those occasions when I was seated in a concert hall with the lights down. I simply allowed the music to play while I thought about other things. When I finally listened, really listened, the music moved me in a powerful way. It was almost a spiritual experience, and that’s not far from the experience I have sometimes when I truly listen to other people. A much better book that touches this area is Thanks for the Feedback: The Science and Art of Receiving Feedback Well by Douglas Stone. There are some awesome insights that I took with me from there. And I want to add The Power of Vulnerability: Teachings of Authenticity, Connections and Courage by Brené Brown. This one highlights empathy, listening and sharing, topics that are dealt also in We Need to Talk: A Practical Guide to the Lost Art of Conversation. Headlee is a news show host on NPR whose primary business is interviewing people and learning from what they tell her. In this book, she uses her own observations backed up with current research to present several ways we can improve the quality of our conversations. Headlee argues that with Americans more divided than at any time in recent history, we are losing the ability to have civil, engaged conversations. The strategies she presents are not necessarily new or groundbreaking, but help us t Headlee is a news show host on NPR whose primary business is interviewing people and learning from what they tell her. In this book, she uses her own observations backed up with current research to present several ways we can improve the quality of our conversations. Headlee argues that with Americans more divided than at any time in recent history, we are losing the ability to have civil, engaged conversations. The strategies she presents are not necessarily new or groundbreaking, but help us to recover the lost skill of difficult and involved conversation. She covers the idea of active listening, overcoming our bias in conversations, and mindfulness. I found this a useful discussion. The only disappointments for me were Headlee's apparent disregard for small talk or banter and her insistence that timing is crucial to good conversation, even to the point that she recommends simply walking away from conversations when we may be too tired or distracted to fully engage. While I understand that she is trying to present culturally specific advice for Americans, I think there are many times when important conversations must happen on someone else's timetable, not our own. I also think that preserve our verbal interactions for "quality" conversations disregards the social cohesion that small talk builds. Growing up in a large family and marrying into a culture that highly values both small talk and deep conversation, I think social interaction is a learned skill but I also think quantity can have a value even when the "quality" of the interaction is limited. Celeste Headlee believes conversation can change the world and after reading her book We Need To Talk, I agree. Good conversations increase our empathy and they help us consider other points of view, whether it's a political issue or how to handle a tricky situation at work or even a helpful tip related to a household chore. We walk away understanding ourselves and the other person better than we did before. This, of course, takes work. More importantly, it takes self-awareness. Most of us believe Celeste Headlee believes conversation can change the world and after reading her book We Need To Talk, I agree. This, of course, takes work. More importantly, it takes self-awareness. Most of us believe we're better conversationalists than we actually are. And there's the rub. When I started reading, I thought I had a pretty good handle on my conversation skills. There are, of course, areas I can work on but overall, I thought I was in pretty good shape. I'm a great listener and naturally empathetic. I used to be a social worker, for pete's sake. It was tempting to think about how much other people really needed to read this book. But Headlee called me out. Well, she called us all out. We've all made mistakes when it comes to conversation. We've said things we wish we hadn't, we've spaced out, our words have hurt the people we love and strangers alike. At a time when we're growing more divided and disconnected, we can't afford not to think about how to converse better. The book is divided into two parts. The first section focuses on the philosophy of conversation. How do we define a good or bad conversation? What can conversation teach us? What does the research say? I found chapter 3 about the hallmarks of good and bad conversation to be especially pertinent. Chapters 4 and 5 made me think a lot about my expectations of conversation and how I can fine tune my approach for difficult conversations. I may or may not have needed this reminder while discussing a hot political topic the other night. The second half of the book offers practical suggestions, such as how to ask questions, the benefits of silence, and why repetition doesn't actually help us communicate. It also discusses when we shouldn't converse- because there are times when this is the correct response. I was underlining and asterisking so many parts. It's made me view conversation in a whole different light and I'm already trying to put her suggestions into practice. We Need To Talk offers practical, insightful advice on how to improve our conversations. It's well-written and easy to read. In fact, it mimics Headlee's advice on how to have better conversations. It's focused and to the point. It's engaging. It asks good questions. It invites us to learn about ourselves and the world around us. The truth is we all need to heed Headlee's wisdom. I have a feeling I'll be referring back to this book for years to come. It's not enough for me to read it; I need to apply its truths to my life. Hold me to it. The ability to hold good conversations has become important to me; the skill for both listening and speaking is one that I would like to sharpen. I came across We Need To Talk via a podcast where I heard the author speak of her work. She made a positive impression. I became curious about her book. The book did not disappoint. Within the pages I found many good and practical pointers to improve conversation for both speaking and listening. The author’s writing style appealed, and her voice throughout made the information presented very accesible. I came away from the book with many quotes and ideas to apply to my daily life. This does not mean my conversation skills improved overnight as that’s a constant work in progress. Rather, I now have a clearer idea on what to keep in mind, where I can improve, and which steps to take over time. This is a book to return to periodically. There is a lot of good stuff to take in. This is a topic that's become deeply important to me over the last few years - both as someone who publishes conversations as podcasts, and in my daily life. We could all listen more - all make a deeper effort to engage. A lot of what Headlee brings up hit bullseyes for me...so here's hoping it will help me be a better listener and a better conversationalist. One of those books that you may already heard of it's content multiple times before but you still need to read it to refresh your mind and to give a bit more effort to understand and think about what the author is saying to fully grasp the meaning behind it all and it's implications. I really enjoyed reading about this and it has made me think about many of the conversations I had, the ones I try to avoid, the ones I listen to half-heartedly, the ones where I can't wait for the person to shut up One of those books that you may already heard of it's content multiple times before but you still need to read it to refresh your mind and to give a bit more effort to understand and think about what the author is saying to fully grasp the meaning behind it all and it's implications. I really enjoyed reading about this and it has made me think about many of the conversations I had, the ones I try to avoid, the ones I listen to half-heartedly, the ones where I can't wait for the person to shut up and leave me alone and the ones where I have hoped I have seen the person's face expression before talking and vise versa. This book shows you that even if you don't think of yourself as a narcissist, it's still something that's in you that will come up every now and then especially in conversations. It shows how much we enjoy the bubble we create and the opinions that we wrap ourselves in without wanting to have a look outside and how that makes us prone to continuously claim we are right and everyone else is wrong without giving them a chance or the benefit of the doubt. I am without a doubt guilty of that as well in most cases. It's not an easy thing to step outside especially when it was quite a journey getting yourself to where you are now whether it's in beliefs or comfort/confidence or the types of conversations you have. This book doesn't only teach us about where we can go wrong in conversations, but the importance to listen to ourselves as well and knowing when to have a conversation and when not to. When it's important to put yourself first and have a break or how to decline someones conversation in a polite way instead of listening half-heartedly and having the other person get annoyed. The importance of actively listening to someone instead of thinking of a quick reply immediately after they finish their sentence. The author isn't one of those people that blames everything on technology and social media. She acknowledges its impact on us not being able to actively listen and have better conversations and the overall repercussions of that (such as empathy and compassion) but she also acknowledges it's importance in ours lives nowadays and I guess it's one of those things that we need to work around it instead of eliminating it because it's not something a lot of people -myself included- will be into. Must read for how to communicate. Don't be shifter, be a supporter. Journalist and radio host Celeste Headlee, in her well-organized and nicely researched work of non-fiction, "We Need to Talk," suggests that too many of us do not listen attentively or communicate effectively. In an age of instant messaging, surfing the Web, Facebook, and email, how often do we have more than a cursory chat with our relatives, friends, neighbors, and colleagues? Although superficial exchanges are the stuff of everyday life, there are instances when hearing what someone else has Journalist and radio host Celeste Headlee, in her well-organized and nicely researched work of non-fiction, "We Need to Talk," suggests that too many of us do not listen attentively or communicate effectively. In an age of instant messaging, surfing the Web, Facebook, and email, how often do we have more than a cursory chat with our relatives, friends, neighbors, and colleagues? Although superficial exchanges are the stuff of everyday life, there are instances when hearing what someone else has to say and conveying what you think and feel can be significant. The words you speak and how you express yourself matter when, for example, you meet with your employer about an important work-related issue, discuss a health problem with your medical practitioner, or try to comfort someone who is bereaved. In her introduction, the author relates the tragic story of a plane that crashed, partly because a first officer was too timid to convince his captain that they should delay takeoff because of dangerous icing conditions. Seventy-eight people perished. Furthermore, Headlee believes that "our world has become so fractured by politics and distracted by technology that having a meaningful conversation can become a challenge." Too often we become irritated when others express contrary opinions. Civility, respect, and tact may go out the window when people get on their soapboxes. In "We Need to Talk," the author offers excellent strategies for improving the quality of our verbal interactions. She touches on such techniques as avoiding distractions; empathizing; acknowledging that we all have biases; disagreeing without becoming disagreeable; getting to the point rather than going off on long-winded tangents; staying in the moment; postponing a conversation gracefully when you are exhausted or out of sorts; admitting that you are wrong and that you don't know all the answers; and listening with an open mind. "I believe with all my heart that we have a window of opportunity right now to make things better in our world and it starts with an act as simple as saying hello to your neighbor. So put away your smartphone for just a moment and go talk to someone. Better yet, go listen to someone. People will surprise you. They will delight you, enlighten you and sometimes anger you. But if you can get past the superficial chit-chat most of us mistake as conversation, people will never bore you." This book was "I believe with all my heart that we have a window of opportunity right now to make things better in our world and it starts with an act as simple as saying hello to your neighbor. So put away your smartphone for just a moment and go talk to someone. Better yet, go listen to someone. People will surprise you. They will delight you, enlighten you and sometimes anger you. But if you can get past the superficial chit-chat most of us mistake as conversation, people will never bore you." This book was not quite what I expected after reading the title (I expected more of a play-by-play of how to have a difficult conversation) but it wasn't an unpleasant turn of content. This book actually reminded me quite a bit--and referenced quite a lot of the same sources--as the other book I just finished, Bored and Brilliant: How Spacing Out Can Unlock Your Most Productive and Creative Self. However, the application here is turned outward instead of inward. I had to swallow my pride a time or two when she describes the key of being a good conversationalist as being a good listener. I consider myself a good listener...but, when comfortable, I like to talk, too. I think I will take a tip from this highly successful journalist and broadcaster and keep my mouth shut a little more often, and ask the right questions a little more often, too. Hopefully, I'll also be able to say like she does, "I'm so sorry, but I really just don't have the mental capacity to listen to you right now. I would love to be more attentive to what you are saying, so let's have this conversation in 5 minutes when I'm not bathing the cat." Okay, the cat line was mine, but it definitely applies. I think her message is an important one because so many people in our society are moving away from empathy, moving toward an "if you voted this way, I have nothing to say to or learn from you" mentality. She writes, "Listening to someone doesn't mean agreeing with them. The purpose of listening is to understand, not endorse. Often we decide very quickly whether or not we will agree with someone. We listen for certain words that might be clues to their politics, or faith, and we use them to categorize people into groups. Into one group, we gather all of the people who think like we do, and into the other group, go all of those who think differently. The problem is, these kinds of groupings are not very accurate." I think we need more patience in our listening, less categorizing and more thought before we eagerly share our own experiences and promote our own interpretations of those. It's something I need to work on, and after reading this book, I feel excited to get to it. Helpful in this post-Trump era. -We cannot multitask. I do this all the time, try to hold a conversation and write or read an email. Just doesn’t work. -Going into a conversation with the intent of changing someone’s mind is more often than not a suicide mission. However listening to viewpoints that you disagree with and allowing the person to explain themselves can create a real conversation where opinions can be embraced if not accepted. -You’ve got 40 seconds of someone’s attention. On a good day. Get to the point. -Ask open ended question, as much as possible. If asked, “Are you a good driver?” What would you say? How about a good listener? “Of course,” I’d reply, without looking up from my smartphone. Our perceptions often don’t match how we are perceived. And common sense isn’t that common after all. Celeste Headlee provides a reality check while teaching her readers the most valuable skill; how to listen. 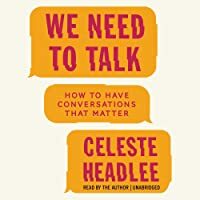 I initially thought the title "We Need to Talk" was a bit dramatic, but Headlee is passionate and convincing about the merits of meaningful conversation and the risks of our deteriorating ability to listen and communicate to ourselves and society; there were many times while reading this book that I found myself nodding along enthusiastically. Headlee frames these benefits and risks at the personal AND global scale, showing the stakes, especially in these divisive times, of being unable or unwil I initially thought the title "We Need to Talk" was a bit dramatic, but Headlee is passionate and convincing about the merits of meaningful conversation and the risks of our deteriorating ability to listen and communicate to ourselves and society; there were many times while reading this book that I found myself nodding along enthusiastically. Headlee frames these benefits and risks at the personal AND global scale, showing the stakes, especially in these divisive times, of being unable or unwilling to communicate with those--an uncle or a congressperson--who might hold wildly different viewpoints. This is a fast read, and it doesn't introduce anything mind blowing (though it does have lots of great quotes! ), but it is a good reminder of how much can be gained by slowing down, truly listening, and making an effort to speak with intention. As it happens, all of that is very hard to do. I'm a committed meditation practitioner and mindful speech is pretty much the most challenging frontier. It's difficult for the average human to listen with presence while actively trying not to pre-meditate a response, all while actively avoiding shifting the conversation to a more preferred subject...like the self. After reading this book I am more aware of my own "conversational narcissism" and notice it more in others, too. I agree with Headlee: it would be valuable if we all practiced listening and speaking mindfully. We should learn this skill at home and in school, and it should be practiced and reinforced with intention. I'm not sure if reading this book will change my behaviors, but noticing is the first step to changing a habit, and I am happy to be reminded that I don't, in fact, want to be a conversational narcissist! Even if I'm only able to be mindful of my listening/speech habits for 2 mins a day, it's a start. I picked up this book after listening to an interview with Celeste in a podcast. She mentioned a few interesting pointers about conversations and piqued my curiosity enough that I got her book. "We Need to Talk" makes the case for in the importance of conversation in society and some practical advice in having good conversations. It's a short read that could have been a quarter of its size and still gotten the same points across. The book is divided into two halves. The first half tries to establi I picked up this book after listening to an interview with Celeste in a podcast. She mentioned a few interesting pointers about conversations and piqued my curiosity enough that I got her book. The book is divided into two halves. The first half tries to establish the importance of good conversations. A lot of studies are cited that all go along the lines of concluding that conversations are important. Most are loosely referenced and described in one or two sentences. They are peppered in between chapters and feel like they could be dislodged with an untimely sneeze. While I welcome the reference to research and figures in books covering soft skills that traditionally have revolved more around personal experience and anecdote, one gets the feeling that the research is only present to lend a shallow "scientific validity" to the arguments in the book (instead of bringing further depth onto the subject). The second half of the book addresses actual advice on having good conversation. Once again, you have the peppering of research but it is accompanied by practical conversation advice. The advice switches back and forth between talking and listening and the majority centers on when to not speak which I think is sound (pun intended) and spot on. In short, "We Need to Talk" is a good primer on conversations with actionable steps on having good ones. It's not deep and light on in depth justifications but there's enough there to make you think differently if you've never thought much about conversations before. 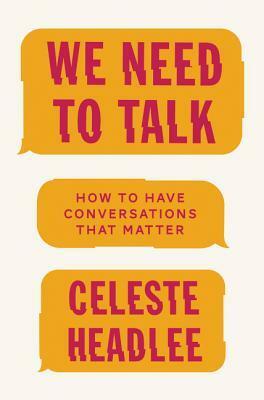 This book is based on NPR show host Celeste Headlee's TED Talk, "10 Ways to Have a Better Conversation." 1. Don't multitask - be fully in or fully out of the conversation. 4. Go with the flow / Travel together. 5. If you don't know, say that you don't know. 6. Don't equate your experience with theirs. 9. Li This book is based on NPR show host Celeste Headlee's TED Talk, "10 Ways to Have a Better Conversation." There are a few other introductory chapters as well. Headlee goes into a lot about empathy. That is totally missing from the talk, but it seems that the solution to nearly all of our "conversational narcissism" and inability to talk to people about touchy issues is because we lack empathy. Research supports this: in a compilation of 72 studies done over 30 years, scientists "found a 40% decline in empathy among college students, with the vast majority of that decline taking place after 2000." We also lack self-control to hold our tongues and let our thoughts go. Headlee gives numerous examples of how meditation has helped her do both of those things, and the results of when she didn't. We don't have to correct people all the time, even if they are wrong. We don't have to say every thought that comes to mind; it doesn't really matter in the end. Keeping quiet is not the same as condoning. The third reason is all of Headlee's personal stories and the bits of research tucked into every chapter. Her stories are so powerful that they are almost unbelievable. I guess that's what happens when you really, truly listen to the person you are talking to. Headlee had me at her dedication, “For Grant: I wanted to be a better person so I could be a better mom.” I think this speaks to so many parents out there. This book is so timely in our current politicized environment and she touches on having discussions with people who differ on politics as well as having productive discussions with your boss or employees. Did you know humans now have the attention span of a goldfish? Technology over the last few years has made up skim and look for sound bites Headlee had me at her dedication, “For Grant: I wanted to be a better person so I could be a better mom.” I think this speaks to so many parents out there. Did you know humans now have the attention span of a goldfish? Technology over the last few years has made up skim and look for sound bites instead of taking the time to read or really listen. I love to blog, but to post and read other blogs it takes more time that I sometimes have. Throwing an update on Facebook takes less than a minute. This affects our conversations too. How many times have you found your mind wandering when someone is talking? Or just waiting for a break so that you could add your own story or comment? Most of us are guilty. This book was easy to read and had great information, even for people who think they don’t need help. I like that she added lots of studies to back up her recommendations. I found so many things to work on in my own conversations. Here are a few tips for you. Put away your phone! Even having your phone on the table inhibits conversation. Be present (meditation can help with this). Be respectful and end on a good note. It’s not about you. Keep it short and don’t repeat (especially the negative stuff). Ask open-ended questions and don’t unload your daily accomplishments on an unsuspecting acquaintance. I've had a hard time rating this book. On one hand, it has its shortcomings: repetitions, diving into unnecessary detail, some inconsistencies between chapters. On the other hand, it introduced me to a few very important concepts and made me look at the way I'm having the conversations. I agree with a general premise of the book – we need to talk with each other more and we need to consciously improve the way we do it. The key takeaways are the model of a good conversation as a friendly game of c I've had a hard time rating this book. On one hand, it has its shortcomings: repetitions, diving into unnecessary detail, some inconsistencies between chapters. On the other hand, it introduced me to a few very important concepts and made me look at the way I'm having the conversations. I agree with a general premise of the book – we need to talk with each other more and we need to consciously improve the way we do it. The key takeaways are the model of a good conversation as a friendly game of catch, the concept of supporting & shifting responses and insight s on conversational narcissism. There's also a quite large overlap with books like "How to talk so kids will listen…". I was one of them, the not so present listener who is always in a hurry because the pressure is always on. This book changed things for me. I look at conversations with fresh eyes and listen with fresh ears. My favourite phrase: Be present or be gone! “It’s not about what someone can do for you, it’s who and what the two of you become in each other’s presence. Headlee, Celeste. We Need To Talk: How to Have Conversations That Matter (Kindle Locations 392-393). Little, Brown Book Group. Kindle Edi I was one of them, the not so present listener who is always in a hurry because the pressure is always on. This book changed things for me. I look at conversations with fresh eyes and listen with fresh ears. My favourite phrase: Be present or be gone! “It’s not about what someone can do for you, it’s who and what the two of you become in each other’s presence. Headlee, Celeste. We Need To Talk: How to Have Conversations That Matter (Kindle Locations 392-393). Little, Brown Book Group. Kindle Edition. I enjoyed learning about many of the research studios and the many ways communication and conversation have been studied. I spotted some areas where I can improve. I appreciated the author’s willingness to share some of her personal experiences. In an odd way, the book itself could get caught in the weeds, from the author’s earnest attempt to make her points in favor of improving conversation skills. This is such a great book, if you’re ready to cringe at yourself a little... or a lot. This practice is super accessible and I’ve already begun making changes and seeing a difference. A lot of this material is pretty intuitive and this is still a great resource for reflection and includes practical applications for improving our relationships. I’ll be revisiting this material frequently. I just wish there was more! I started reading this book when I had a bad conversation with my acquaintance. That conversation with him let me realize I was neither engaged in the conversation nor empathetic. In other words I was not "listening", I was hearing what I expect him to tell. This book taught me a lot. My insincere attitude/words/actions can hurt someone's feelings. When I have no mental energy to be engaged in a conversation I'd better politely walk away. Other than this, this book offers various valuable lifelon I started reading this book when I had a bad conversation with my acquaintance. That conversation with him let me realize I was neither engaged in the conversation nor empathetic. In other words I was not "listening", I was hearing what I expect him to tell. A great read for everyone. Learned some fun stuff. Fantastic. This is a great book for ANYONE. Learn how to have a good conversation and just shut-up and listen. Tips and tricks. Also, multi-tasking is NOT A THING. I really enjoyed "reading" this book. I listened to the audiobook, read by the author (She has a radio show and has a great voice!). The stories she tells and the studies she cites are very interesting. The information about bias and empathy was thought-provoking. I recommend it! A great read, thoroughly enjoyed the material and the easy, accessible way in which is was presented.